Power racks for the home are one of the best piece of equipment to have in your own home gym. It works both your upper and lower body via the various exercises that it can accommodate such as squats, push up, bench press etc. Of course, the more functions a power rack can perform, the more expensive it is. Depending on your budget and needs, below are top 3 rated power rack for the money. If you need some advice on what to look out for, check out the power rack buying guide here before looking at the individual models. Atlas’s Deadlift HD lift strikes a beautiful balance between price and value. It is not the most affordable nor is the most premium quality. However, for its excellent design, materials and price, it is probably the best value for money power rack one can buy right now. Let’s talk about the materials first. It is made of strong and heavy duty steel. As a result, it is sturdy and wouldn’t move even when you are doing pull ups. In terms of functions, the base can be extended to accommodate a bench as well as plate support. The plate support is especially useful as there isn’t many power racks that has this function with this price range. The extension also creates more space for you to do your squats such that your feet wouldn’t be banging against the base structure. Finally, with the numerous holes, this power rack can fully adjust to any height requirements. Spotter catches wise, it can support up to 500 lbs. This is important as these are meant to save your life when things go wrong during your weight lifting or squats. One reviewer mentioned he dropped 300 lbs from a height of 12 feet a couple of times during squats and the power rack did not suffer from any bends or cracks. Despite its numerous advantages, there are 1-2 design flaws that should be pointed out. For one. the pull bar is really high up. If you have a low ceiling, you will not be able to get your head above the bar without banging your head. Second, the plate support at the back means you need a bigger floor space if you intend to leave your plates at the power rack. It will be more space saving if the plates support is at the side, like how commercial power rack do it. Finally, it takes about half an hour to do the assembly. You probably need a person to help hold down the base as you try to set up the four beans. Note that the front and back beams are not identical. Make sure you know which is which before setting them up. One reviewer made this mistake and had to redo everything! Overall, the Atlas power rack is a solid value of money power rack. With quality materials, practical design and a mid range price level, it is a solid purchase if you want this for your home gym. For the budget conscious, you can’t go wrong with the Cap Barbell power rack. 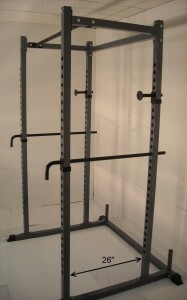 It is a quality basic power rack that is made with steel. For straight forward exercise such as pull ups, squats etc that puts the weight down right the center, it works wonderfully for up to 300lbs. However, its most attractive feature has to be the price. If you are looking not to spend too much money and wants something basic but quality, the Cap Barbell offer the best value for money. Its weakness is its inability to support exercises that pulls away from the center. For example, if you are doing kipping movement, then you will sense that it is not too stable unless you add some weight to the base of the power rack. However, only the right side offers such plate support so there is a limit to how much weight you can add for stability. Assembling this power is similar to other racks. It should take you no more than 90 minutes of work. Powerline power rack is another quality product that you can consider for your home gym. I didn’t put it as the editor’s choice as it costs more than that option. You might get some better stuff but I feel that is not worth the additional money I need to pay for. Make no mistake, this is a quality power rack. It can support 300 lbs easily with no noticeable movements or shakiness. It als0 comes with base extensions that let you add a bench, dumbbells etc. In fact, I would say this design takes up a little less space than the Atlas model. The only flaw is the paintwork which can come off rather easily. This not makes your equipment looks older than it should, it also creates some degree of messiness on the floor that you probably need to clean up. It is not a big issue but something that you should be aware of. In terms of putting it together, there was no major problem. There was one reviewer who mentioned that his equipment had holes that did not line up in straight line so that presented some challenges. Other than that, everything else was pretty straight forward. There is no one ‘best power rack’ that fits all purpose and needs. Some might just want a basic setup for strength training while other require a multi functional rack for different exercises. So, this guide is meant to help you decide what particular items to look out for before looking at what is available in the market. Only by knowing what you need will you be able to purchase the right model. One of the most important feature for a power rack is its sturdiness. Specifically, you don’t want the rack to move while you are doing your pull ups or another exercises. For that, you need the rack to use heavy and sturdy materials, rather than cheap metals that might bend or move during exercising. The design of a power rack determines how many different types of exercises it can support. 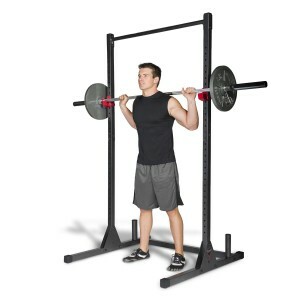 Some have extendable bases that can be pulled to support a bench for bench pressing or pull up bars for pull ups. Others have room for plates storage although they tend to be more expensive. So, depending on what you are using it for, you need to determine what the functions you need in a power rack. The size of the power rack is another important consideration especially for homes with limited spaces such as apartments. Look for one that is relatively easy to assemble and doesn’t require any special tools and such. Best of all, check the reviews section to see if the assembly tools come with the package. That will be the most ideal case. Overall, buying a power rack for home use is not an easy decision as there are many factors to look out for. Hopefully, this article will narrow down the choices so that you know what is the best option when it comes to top rate power rack for the money.